As you are planning your vacation, you are probably planning your vacation wardrobe, too. Given today’s baggage fees and weight allowances, the outfits you choose for your trip will often have to do double or triple duty. Having pieces that can mix and match or be layered is an essential consideration when packing for a trip. Accessories can also extend the style of every outfit that you pack. One of the first rules is to consider your chosen destination. For instance, on a fall trip to China, it would be cold in the north and progressively warmer as you travel south. For a trip like that, you can pack a variety of tees and shirts that could be layered for warmth then discarded as it becomes warmer. Most beach destinations experience warm days followed by cool evenings, so layering is a natural choice. Chic print dresses generally pack well and pair with everything from a light jacket to a cotton top if you need a little additional coverage. A maxi dress will easily go from a day of sightseeing to an elegant dinner on the beach. Pair it with leather sandals and accessories and you are ready for whatever the day brings! The natural textures of a woven bag just shout vacations at the beach. Find a crossbody purse that is perfect for a jungle tour or a day pursuing souvenirs in island shops then heading to the bar for an evening drink. Natural materials not only are beautiful and stylish, they are hardwearing so they will sail through the challenges of travel beautifully. One thing that is a must for any woman who wants to be stylish in a warm, beachy environment is linen. Linen tops, pants and dresses work hard in warm, humid environments. Don’t worry too much about them wrinkling too much. Also, linen fabric breathes and dries quickly so it is a perfect fabric for sunny, humid locales. A linen or linen blend top works well with jeans or shorts. It also makes a great top to go with your casual print dress. Whether you select a dramatic wide brimmed hat or smaller brimmed visor, the hat is essential in sunny locations. Not only will they protect your skin from too much sun, they will also keep you cooler during those long afternoon jaunts to see the sights. As you are selecting the perfect hat for your journey, look for one that has “packable” on the label. This way, if you don’t feel like wearing on the plane, you can shove it in your suitcase or carry on and not worry about it. 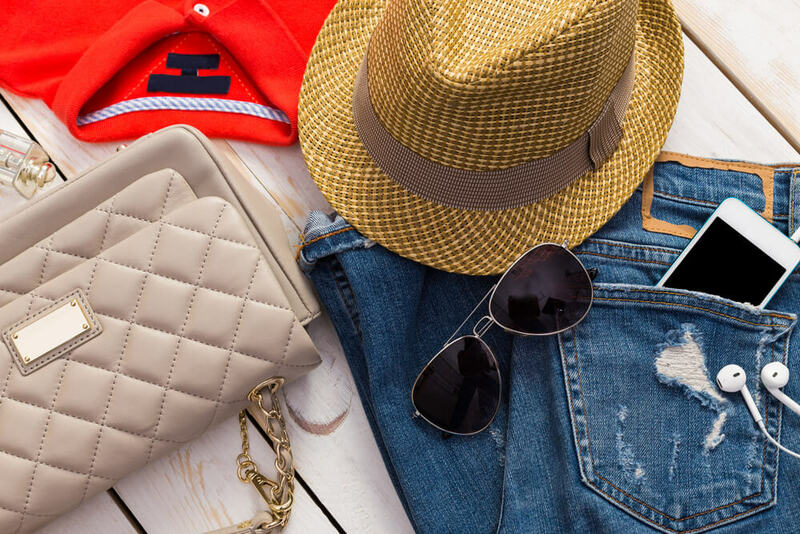 Packing for vacation doesn’t have to be a challenge. It just requires a little planning. By considering how pieces work together at your destination, you’ll realize that you don’t have to pack your entire closet to feel glamorous. Come see us at Bryd Mill, Carys Lane, or Red Horse Boutique to get all your vacation necessities!